Specialising in wedding decor and corporate event theming, Styled Events brings an element of chic sophistication to any occasion. Our talented team of stylist can enhance any space to create an unforgettable atmosphere complete with that ‘wow’ factor. 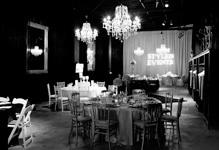 Styled Event’s dedication and unique attention to detail will ensure your event is the ultimate in style and elegance. Visit their studio at 71 – 75 Victoria Street West End for some amazing inspiration.